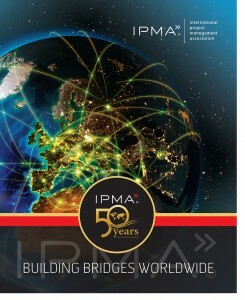 Through this site you can download the 50th Anniversary Book of IPMA. It is a celebration of fifty years of IPMA, of project management development, of a professional community. It is also a great foundation for many more years of going on journeys, travelling and searching for success. So if you have only just heard of IPMA or you are a member of the family for many years you will find this book interesting, entertaining, informative and encouraging. You can use it as a reference book to find information from time to time about IPMA and the global range of friendly national bodies. You can use it to induct potential or new members of the family or customers for the ever-growing goods, products and services. These messages of the book convey the spirit of IPMA, the achievements access fifty years and at the present, and confirm the strong foundations of IPMA going forward. They also suggest some celebrating. Now, you all 50th Anniversary book represents multicultural volume where you can find more about IPMA history, products and services and success stories that are the crown of our standards. Each member association of IPMA is represented with its own story, pecularities and colourful pictures. And, with each new member association IPMA is building bridges worldwide to achieve its vision promoting competence throughout society to enable a world in which all projects succed.